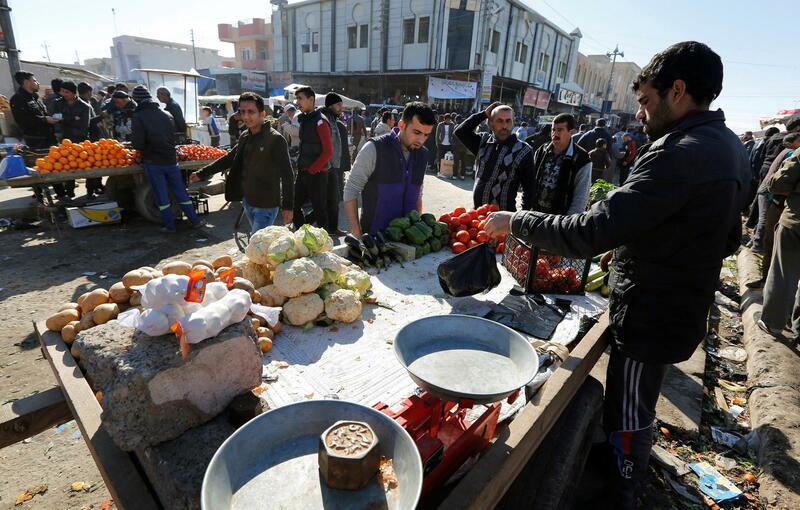 People shop after returning to their homes in east Mosul in January. 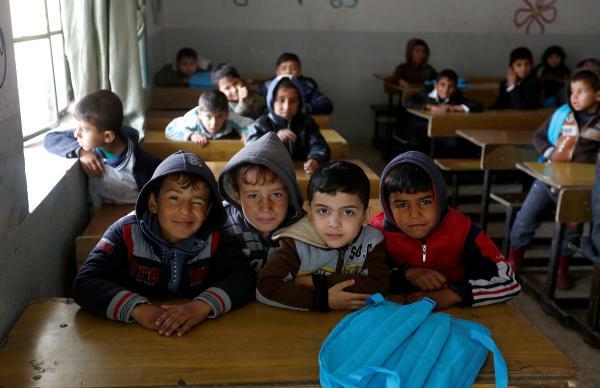 Schoolchildren pose for a photo in a classroom at the al-Kufa school in Mosul. His parents were afraid the extremists would take him and forcibly enlist him in jihadist training camps for boys, known as the "Cubs of the Caliphate." "ISIS was taking children my age," he said. And like most children, he was kept at home from ISIS schools by his parents, who were horrified by a curriculum that revolved around violence. Last month, Iraqi security forces, with support from a U.S.-led coalition, forced ISIS out of the eastern half of the city. Unlike in other Iraqi cities retaken from the extremists, most of the infrastructure remained in place and intact. So did the civilians. "I felt as if I had been reborn into this life," said al-Kufa school principal Saed Ali Judei, of coming back to work. His is one of 70 of about 400 schools in east Mosul that have re-opened under government control, with help from UNICEF. The riotous noise of children's laughter in the schoolyard is matched by a bustle in the streets: Markets are open and busy, men are mending roads damaged in fighting, traffic is surprisingly dense. It feels optimistic, and many people say how happy they are the fighting for this half of the city is over. But as Iraqi security forces and their international allies gear up for an assault on ISIS in the western side of Mosul, concerns about the east are beginning to bubble up. In a more rural area of eastern Mosul, Zainab Abdeljabbar, a teacher, pointed out damage to a nearby house. "We cannot say it is safe here," she said. "Yesterday there was a drone, it dropped a bomb here and four people were injured." ISIS has often used armed drones. This one likely came from somewhere on the eastern side of the city. There have also been recent sniper attacks and a suicide bombing at a restaurant, indicating the militants are still hiding out in the area. "We are liberated, but we are still scared because we don't know what they will do," Abdeljabbar said. "I don't think the Iraqi people are in a good situation." Air Force Brig. Gen. Matthew Isler, with the U.S. troops assisting the Iraqi security forces, confirmed the use of armed drones by ISIS. "What they have not been able to do is precisely target," he said. "Instead they are looking for large gatherings and dropping [bombs] on civilians there. It is just another example of the atrocities that they commit." He said that the U.S.-led coalition regularly conducts airstrikes against ISIS militants who fire mortars indiscriminately across the river Tigris from Mosul's west side, which they still hold. Even as the militants continue violence, there are doubts about the capabilities of the Iraqi forces that hold eastern Mosul. The Iraqi army is coordinating national forces, including the federal police, alongside local forces, including police and tribal fighters. But there is jostling and competition among the troops. One local group, the Nineveh Guard, is controversial because of its support from Turkey, which has fallen out of favor with the central government in Baghdad. One of the Nineveh Guard commanders, Gen. Mohammed Saleh, said his men fought — and more than 30 died — to free Mosul from ISIS. He wishes they had more power and were stationed in the center of the city, not on the edge. "It was an unfair decision against the Nineveh Guards – all of us are from Mosul," he said. "We know the city streets and the ins and outs of the city. We know [who] is working with the terrorists there." Saleh criticized some other forces operating in the area, including some backed by Iran, which he said discriminated against local people and had too much influence in Iraq. He may have a point. Human rights groups have raised concerns about abuses by numerous branches of Iraq's security forces and paramilitaries. But the disunity does not bode well for the chances of these forces holding firm against the still very real ISIS threat. The Tigris River divides Mosul, Iraq. ISIS has held the western side of that city for more than two years. And Iraqi forces backed by U.S. airpower retook the eastern side of the city a couple of months ago. They're now preparing to cross the river to try to retake the remaining ISIS area. NPR's Alice Fordham is in Iraq and joins us. Alice, thanks for being with us. ALICE FORDHAM, BYLINE: Good morning, Scott. SIMON: What can you tell us about the preparations to take on ISIS in western Mosul? FORDHAM: Well, American and Iraqi military officials say they've stepped up airstrikes. That's something that's confirmed by civilians still on the ground in western Mosul. A lot of troops have moved to the south of the city in preparation for the offensive. It seems like that's where most of the fighting is going to start. The bridges across the Tigris and the city itself were actually destroyed in the fighting. So they have to use bridges south of the city. There are reports they've set up floating pontoons also. We know it's anticipated that this will be a hard fight, maybe even harder than the eastern side of the city. SIMON: How is the eastern side of the city that's been retaken from ISIS doing now? FORDHAM: Well, of course, after it was retaken, there was celebration. One reason for that is that the fight to take it back from ISIS didn't leave it in as bad a state as we've seen in other similar situations in Iraq. And the Iraqi security forces use different tactics to keep the people in their homes and preserve the infrastructure in place. So that's something that people are happy about, but it doesn't mean that everything is exactly OK now. It had been a very troubled place for a decade before ISIS took it. And there's a lot of dispute about who's actually in control there now. I was there last week and was able to talk to people about what life has been like. I can play you some of those voices now. In the eastern half of Mosul in cinderblock neighborhoods that lived under ISIS for more than two years, there's a strong sense of relief that the battle to free that part of the city is over. WAAD AL AMERI: (Foreign language spoken). FORDHAM: The first thing that's changed is that the security situation, it's OK, says Waad al Ameri, a local leader here and also a civil servant in a tax office. FORDHAM: Sure, he says, there aren't services yet. There's no electricity. And the United Nations is having to truck in water, but he says they're safe. FORDHAM: When ISIS was in control, there was shelling and airstrikes. And then, this winter, there were months of heavy fighting as the extremists battled Iraqi security forces. I asked Ameri what he thinks the next few months hold. FORDHAM: "Well, the government would bring back services," he says, "and the security will improve." But as I walk through this rural area, although it seems really peaceful, not everyone shares Ameri's optimism because there are still threats. FORDHAM: I speak with a teacher named Zainab Abdeljabbar. ZAINAB ABDELJABBAR: (Foreign language spoken). FORDHAM: She says there was a drone, an ISIS drone, the previous day that dropped a bomb on a family gathering in a house very nearby. She points to it. Four people were injured. The drone probably came from somewhere in eastern Mosul. To get more insight into what ISIS is still able to do in eastern Mosul, I Skype with Brigadier General Matthew Isler with the U.S. forces assisting in Iraq who confirms the extremists are using armed drones. MATTHEW ISLER: What they've not been able to do is precisely target. Instead, they are looking for large gatherings and dropping on civilians there. And it is just another example of the atrocities that they commit. FORDHAM: There have also been a few suicide bomb and sniper attacks. Isler also says ISIS - whom he refers to as Daesh - are firing mortars from the west side of Mosul, which they still hold, into the eastern half of the city. ISLER: Each day, over the past several days, Daesh has been shooting between 70 and 100 projectiles per day from multiple locations. FORDHAM: Not only is ISIS conducting attacks in eastern Mosul, but there are questions too about the forces holding this part of the city. There's competition for control and resources with some locals feeling they've been edged out in favor of national troops. FORDHAM: I meet for tea with men from the Nineveh Guard, one of the local forces. One of their commanders, General Mohammed Saleh, wishes his men had more power and were stationed in the center of the city, not on the edge. MOHAMMED SALEH: (Through interpreter) It was an unfair decision against the Nineveh Guards. All of us are from Mosul and we know the city streets and the ins and outs of the city. We know who's working with the terrorists there. FORDHAM: The general is also highly critical of other forces here. The grumbling doesn't seem to bode well for the chances this patchwork of troops can work together against the real threat still posed by ISIS here. Alice Fordham, NPR News, Mosul. Transcript provided by NPR, Copyright NPR.